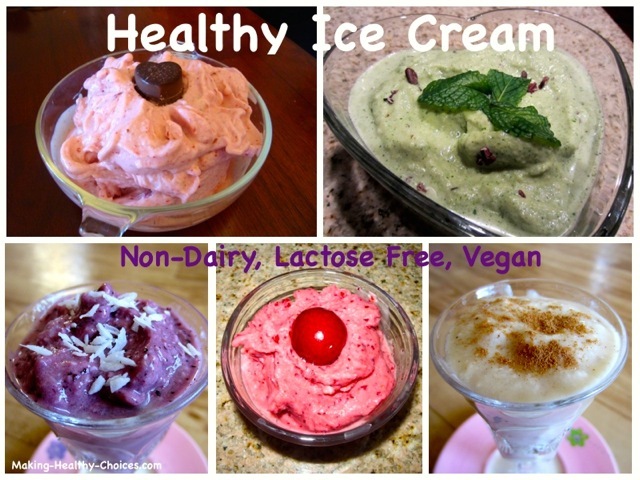 These vegan ice cream recipes are easy to make. They are raw, natural, organic, non dairy and absolutely delicious and refreshing. 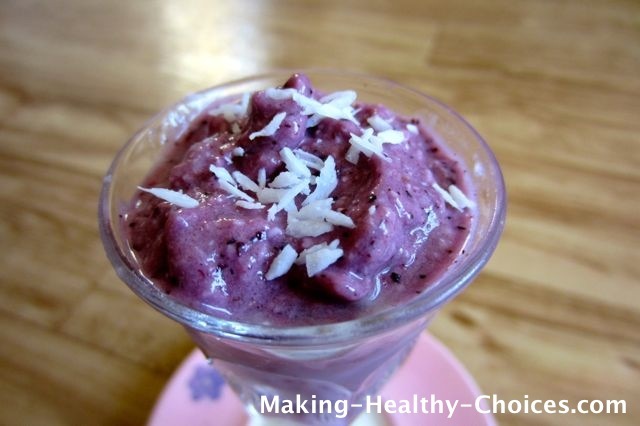 These healthy treats are highly nutritious and full of antioxidants. They are easy on the body and non-mucous forming, unlike ice creams made from dairy. There is no refined sugar or any other unhealthy ingredients in any of these healthy dessert recipes. Remember to use good quality organic ingredients and to start all of your vegan ice cream recipes with LOVE - it is the secret ingredient that make all your creations shine! Place everything except the cacao nibs into the blender (I use a Vitamix Blender) and blend together into an ice cream. If needed, use a small amount of almond milk to assist in blending. Pour ice cream into a bowl and fold in cacao nibs. (Learn where raw cacao comes from, here). 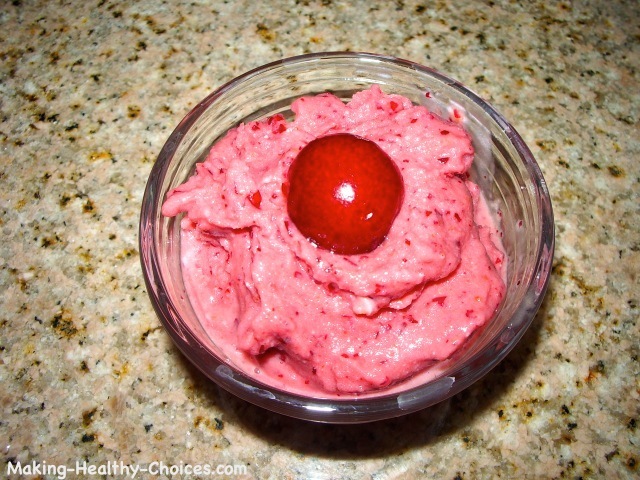 Place frozen cherries in blender (I use a Vitamix Blender) and blend adding just enough almond milk (not much, if any, is needed) to make a nice ice cream consistency. 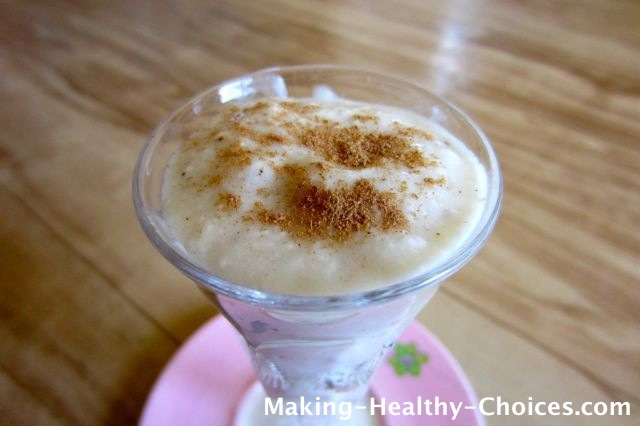 VARIATION: Add in a frozen banana to add another level of sweetness and a different flavor profile. A drizzle of hibiscus syrup over top just before serving would really take this over the top! Strawberries and bananas taste wonderful together, the proportions are up to you.. play and come up with the ratio that you love. 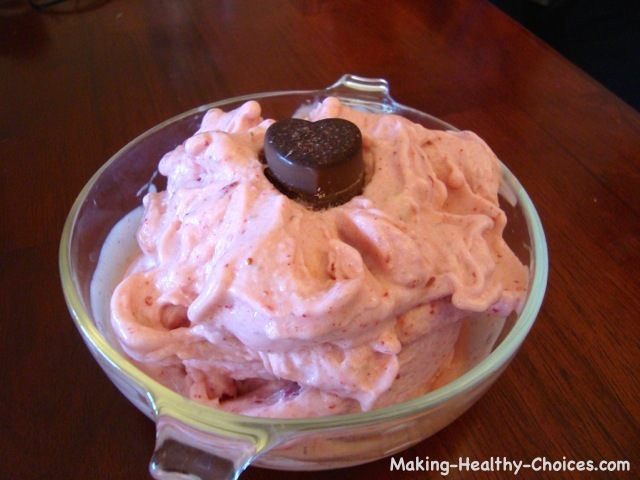 Place frozen strawberries and bananas in the blender (I use a Vitamix Blender) with just enough almond milk (not much, if any, is needed) to blend into a nice ice cream. The frozen fruit can also be put through your juicer, using the blank plate, which also produces a beautiful ice cream. Garnish with a slice of strawberry or with a homemade vegan chocolate (as seen in picture above) or a drizzle of hibiscus syrup. 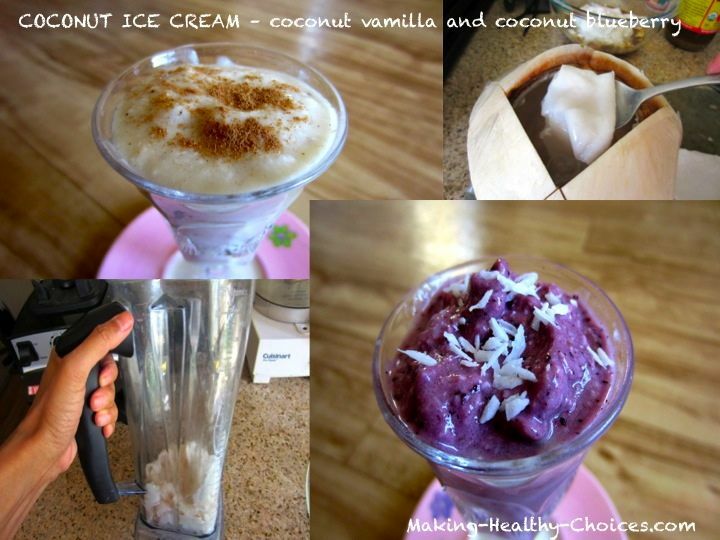 To prepare for these vegan ice recipes, scoop the coconut meat out of a young coconut and place in a container in the freezer. Do this way ahead of time so you have the frozen coconut meat ready to go when you are ready. Not sure how to open a fresh coconut? Click here for a video. Immediately upon scooping the meat from the young coconut, place it in a container in the freezer till frozen. Blend all ingredients in a high powered blender (I use a Vitamix Blender). Serve immediately, garnishing with a sprinkle of cinnamon or a drizzle of hibiscus syrup. Serve immediately, garnishing with a sprinkle of shredded coconut. Date Syrup is easy to make. Pit and soak dates in water for at least an hour. Can use the soak water alone for a light syrup or blend soaked dates together with soak water in blender for heavier syrup. Adjust water to adjust heaviness of syrup. This can be made ahead of time and stored in the fridge. Cacao Nibs are pieces of the raw cacao bean. This is the original form of chocolate. Raw cacao is high in magnesium and antioxidants. If you can't find raw organic nibs then buy the whole bean and then break into small pieces. Mint comes in many varieties. It is known to work against viruses and bacteria. It is uplifting and invigorating as it promotes circulation of energy, blood and lymph. Peppermint has long been used as a digestive aid. 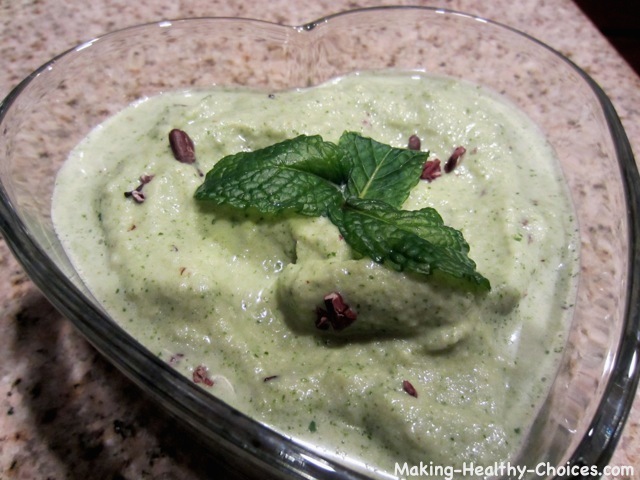 When in season mint is widely available at farmers markets and grocery stores. Cherries are an amazing little fruit. They are full of antioxidants and are known to lower inflammation. Cherries are a wonderful food for our blood. They are an excellent source of iron as well as a range of other nutrients. When in season cherries are widely available at farmers markets and grocery stores. Juicer: The juicer I use is a twin gear Kempo juicer that I have had for well over a decade.